The Tornado multirole aircraft, for ground attack and air defence. Sidewinder missiles (top) and Skyflash missiles (bottom) are amongst the Tornado's range of weapons. Storm Shadow cruise missiles, which entered initial operational service on Tornado aircraft in March 2003, in support of Operation Iraqi Freedom. The GR 1B maritime attack Tornado with wings swept. In all 142 of the Royal Air Force GR 1 Tornados have been upgraded to Tornado GR 4 configuration, under the RAF Tornado mid-life update programme. Tornado F3 Air Defence Variant has been designed to fulfil the requirement for a long-range, long-endurance fighter intercept aircraft. A Panavia Tornado GR 1 shows its low-level flying capabilities. The Tornado multirole aircraft is operational in five different forms: Tornado GR 1 interdictor strike aircraft for close air support; counter air attack and defence suppression; GR 1A tactical reconnaissance aircraft; Tornado GR 1B long-range maritime attack aircraft and Tornado F3 long-range air defence fighter. The GR 4 is a mid-life update of the GR 1. The Tornado entered service in 1980 and ceased production in 1998. The Tornado was manufactured by Panavia, a consortium of BAE Systems, EADS (formerly Daimler-Chrysler Aerospace) and Alenia Aeronautica. "The Tornado was manufactured by Panavia, a consortium of BAE Systems, EADS (formerly Daimler-Chrysler Aerospace) and Alenia Aeronautica." Tornado GR 1 interdictor strike (IDS) aircraft are in service with the German Air Force and Navy (290), Italian Air Force (90), UK Royal Air Force (186) and the Royal Saudi Air Force (96). The aircraft is equipped with an advanced sensor and defensive aids suite for low-level, deep-penetration missions in all weathers by day and by night. The aircraft is fitted with two 25mm cannons on each side of the fuselage. The aircraft is equipped with a wide range of weapons. For close air support and interdiction, the aircraft is typically equipped with iron bombs, cluster bombs and laser-guided bombs. In the defence suppression role, it is equipped with anti-radar missiles. German Air Force Tornado aircraft will be armed with the IRIS-T infrared-guided air-to-air missile, being developed by BGT. The comprehensive suite of navigation equipment includes a Raytheon Systems terrain-following, ground-mapping radar, Decca Doppler Type 72 radar and BAE Systems FIN1010 three-axis digital inertial navigation system. Tornado has a multimode APFD auto pilot and flight director from BAE Systems. The aircraft’s TACAN (tactical air navigation) system is the AD2770 from BAE Systems or the Alcatel SEL AG Sector-TACAN. The instrument landing system is the Cossor.CILS75/76. In July 2002, the Italian Air Force signed a contract with Panavia to provide a mid-life upgrade (MLU) for 18 Tornado IDS aircraft. The MLU included: a new Litef GPS satellite system, a radio, Galileo Avionica radar altimeter and Thales TACAN and the ability to deploy GPS and laser-guided munitions, as well as the Storm Shadow stand-off cruise missile. The first was delivered in July 2004 and deliveries concluded in 2007. A contract for the upgrade of a further 15 aircraft was signed with Alenia Aeronautica in November 2007, for delivery in 2009-2011. Four upgraded aircraft were deployed to Afghanistan in November 2008. In September 2006, BAE Systems was awarded a contract to upgrade 80 Tornado fighters of the Saudi Arabian Air Force. More than 140 (142) of the Royal Air Force GR 1 Tornados have been upgraded to Tornado GR 4 configuration, under the RAF Tornado mid-life update programme. The first entered service in 1998 and the GR 4 received operational clearance in April 2001. Final delivery was in June 2003. The upgraded aircraft are planned to stay in service until 2025. The new systems have been developed by BAE Systems. "In September 2006, BAE Systems was awarded a contract to upgrade 80 Tornado fighters of the Saudi Arabian Air Force." The programme involved advances in systems, stealth technology and avionics. A digital avionics bus links the new systems and fully integrates the aircraft’s improved defensive aids suite. The weapons bus is configured to control the release of a wide range of weapons and can adapt for future weapon types through the system’s missile control and weapon programming units. Upgraded navigation systems, including a global positioning system (GPS), BAE Systems Terprom digital terrain mapping system and Honeywell H-764G laser inertial navigation system (INS), are now integrated into the aircraft’s main avionics system. The GR 4 is fitted with a pilot’s head-up display, multifunction head-down display and a digital map. The BAE Systems TIALD thermal imaging laser designator pod, which provides high-accuracy autonomous guidance for laser-guided weapons, has been integrated on the upgraded aircraft. From February 2007, a number of GR 4 aircraft operating in Iraq are being fitted with the Rafael ‘Litening’ III targeting pod. The four-nation Eurofighter Typhoon is a foreplane delta-wing, beyond-visual-range, close air fighter aircraft with surface attack capability. The GR 4 is equipped with forward-looking infrared (FLIR). The thermal image is projected onto the pilot’s head-up and head-down displays. The GR 4 has been cleared to carry enhanced Paveway II bombs, with GPS/INS (global positioning system / inertial navigation system) guidance. Raytheon was awarded a contract to integrate Paveway IV on the Tornado in February 2008, which was completed in July 2009. The aircraft are armed with the Brimstone anti-armour missile system, which entered service with initial operational capability (IOC) on the GR.Mk4 aircraft in March 2005, and Storm Shadow cruise missiles, which entered initial operational service on the Tornado aircraft in March 2003, in support of Operation Iraqi Freedom. The GR4 can also deploy the Goodrich Raptor reconnaissance pod which replaces the current Thales Optronics (Vinten) VICON system. Raptor consists of the DB-110 reconnaissance system with CCD day sensor and mid-wave indium infrared sensor. It provides real-time day and night targeting with a range of 72km (electro-optic) and 36km (infrared). The pod received initial operating capability in September 2002 for deployment in Operation Iraqi Freedom in 2003. It was cleared for operational use in January 2008 and was deployed to Iraq in June 2008. The GR 4 has undergone a further cockpit upgrade consisting of a new Astronautics pilot’s multifunction display and the BAE Systems TARDIS (Tornado advanced radar display and information system). The upgrade entered service in 2009. The low-level, high-speed reconnaissance Tornado GR 1A is in service with the air forces of Germany, Italy and Saudi Arabia. The aircraft provides real-time reconnaissance, with facilities for in-flight review of reconnaissance data, recording for post-flight analysis and instant ground access to recorded imagery. The electro-optical suite comprises three internally mounted infrared sensors linked to a video recording system, providing 24-hour, horizon-to-horizon surveillance coverage. The GR 1B maritime attack Tornado is in service with the Royal Air Force. The aircraft is equipped with up to four Sea Eagle anti-ship missiles. It can strike at a distance more than 400 miles from base and is able to launch the missiles at stand-off range. The F3 air defence variant (ADV) Tornado is armed with short-range and medium-range air-to-air missiles. A typical weapons payload would include four Sidewinder short-range missiles and four Skyflash medium-range missiles. 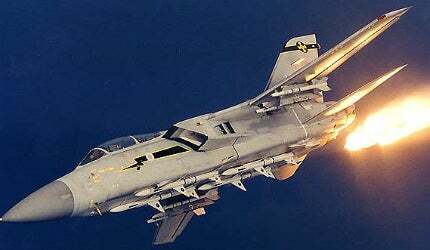 Tornado F3 aircraft were the first aircraft to be fitted with the short-range MBDA ASRAAM air-to-air missile which entered service in January 2001 and was declared ready for operational deployment in September 2002. In all, 100 RAF F3 Tornadoes have been upgraded to carry AIM-20 AMRAAM air-to-air missiles, a Raytheon IFF 4810 SIFF (successor identification friend or foe) system and Honeywell laser inertial navigation system. The aircraft is equipped with a BAE Systems Foxhunter radar, which provides long-range search capability and enables the aircraft to engage targets at beyond visual range. A Tornado F3 in training flight crashed on 2 July 2009 at Glen Kinglas in Argyll, Scotland. The RAF Tornado F3 fleet was retired in March 2011 and replaced with the Eurofighter Typhoon.